Intel builds its processor chips at giant facilities in Arizona that look like sets from a science fiction film. Palicomp is based on an industrial estate in the famous railway town of Crewe. Intel clocks the i5-8600K processor at 3.6GHz. Palicomp has tweaked it up to 1.8GHz. You can’t argue with maths – that’s one-third cooler. Not literally cooler, of course: the overclocked chip inevitably runs pretty warm. In our tests, however, it only occasionally hit a maximum of 90°C, which is 10 degrees below its safe limit. And it delivered excellent performance all round, excelling, thanks to its six cores, at multitasking and demanding jobs like photo and video editing. Having said that, Intel is lacing stiff competition from AMD’s rival Ryzen processors at the moment, and generally the overclocked i5 was a whisker off the pace of the Ryzen 5 1600X we saw in the slightly cheaper Wired2Fire Pyro Reactor, or the new Ryzen 5 2600 in the Pyro Talon that we tested two weeks ago. The Cosmos has a few more feats of engineering to boast, though. Its graphics card is a GTX 1070, superior to the Pyro Talon’s 1060. This can run most 3D games on high settings at 4K, if you have a screen capable of it. And if you stick to Full HD resolution you can max out the quality options on almost anything. With a generous 8GB of its own video memory on board, it’s ready to lend a big helping hand to graphics card-compatible creative programs too. While it’s not uncommon to see Windows 10 installed on a 256GB SSD in PCs at this kind of price. Palicomp has outdone the majority by fitting an NVMe drive that takes proper advantage of the M.2 socket’s PCIe bandwidth, far exceeding the traditional SATA interface, to deliver read speeds of 2,655 megabytes per second in our tests. Even write speeds peaked at 1.372MB/S, nearly three times what you’d expect from a SATA SSD. That helps to make the Cosmos feel very responsive in everyday use. which in our book is just as important as chewing through the kind of multi-processor video rendering tasks you might only- throw at your PC once a month. There’s also a slow but large 2TB hard drive for the rest of your files. Although expansion space is a bit limited, you could fit one more 3.5in hard drive, a 2.5in drive and another M.2 SSD. There’s a second last PCIe xl6 slot, four regular- speed slots and two more RAM sockets free as well. You might well consider expanding the default 8GB of main memory, which could be a little tight for the kind of work this machine is capable of. External ports are USB 3.0 only, which is quick enough, at 5Gbps, for most current SSDs, but won’t support external drives as fast as that internal unit. 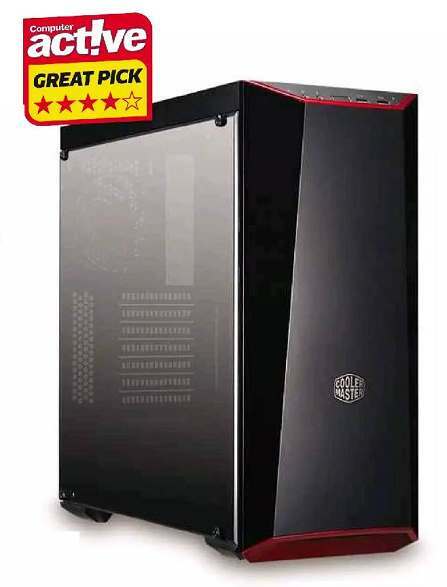 So is this the best PC for your money? If gaming isn’t a priority and you don’t plan to run other software that demands either a super-fast graphics card or super-fast storage, but you want plenty of raw processing power, the Wired2Fire Pyro Talon looks tempting at over less. But the Cosmos is fairly priced considering all its specs, and a superb all-rounder.